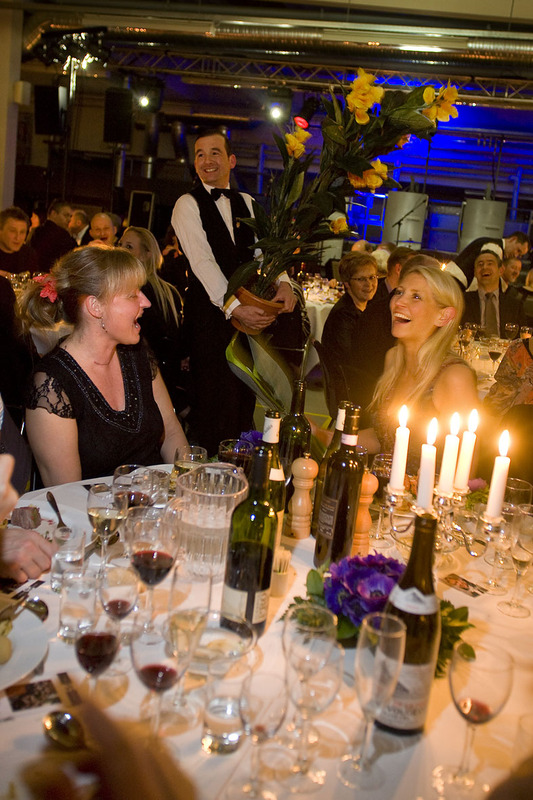 We have covered coporate events with 8 to 2500 guests and can offer from 2 to 25 comedy waiters. We have performed in buses, trains, airplanes, conference centers, private dining rooms, streets, shops, restaurants, cafés, beaches, hotels, gardens and castles. We have performed at dinners, receptions, incentives, company parties, product launches, seminars, award shows, Christmas lunches and sales meetings. 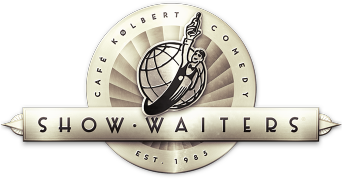 More than 25 years of doing more than 400 shows per year makes us the world’s most experienced comedy waiters by far. We have performed for some of the largest companies in Europe, entertaining audiences from every part of the world. We know that preparation and communication is the key to success. We make sure that all is arranged with the venue, the chef and the real waiting staff. This hilarious show is a sophisticated and extremely funny combination of improvised interaction with the guests and top grade stage performance (no actual stage needed at smaller events). It normally runs for about one hour while the guests eat, drink and talk. It is flexible, professional and elegant entertainment that can be adjusted to fit any needs and will make your event an unforgettable avalanche of laughter. In short, a Café Kolbert Show is the perfect entertainment for receptions, dinners and parties. And if you don't believe us, try us! General Motors, Maersk, Coca Cola International, Lego, H&M, Singapore Airlines, Carlsberg, Bang & Olufson, Sony Playstation Europe, Volvo, Lundbeck, Nestle, Thai, South African Airways, VW Group, AstraZeneca, Novo Nordic, Siemens, Daimler-Benz, Lufthansa, Deloitte, Fujitsu, Arla, Peugeot, Air New Zealand, The Cultural City of Europe, Varig, Bauhaus, Bayer, Nokia, Ferring, Novartis, Sony Ericsson, IBM, IKEA, Clinique, Ecco, Estee Lauder, Martin Professional, Vero Moda, Polar Seafood, Gillette, DHL Express, Colgate, Osram, Oticon, Esselte Staples gmbh, Alfa Laval, Hydro Aluminium, Royal Arctic Line, Danfoss, GN Resound, Molnlycke, JP Morgan Credit, Skanska, Mercuri Urval, Boston Scientific, Saxo Bank, Oracle, Dong Energi, Toyota, Castrol, FC Copenhagen, The Danish National Bank, Cimbria, Unigrain, Rockwool, DR, Minolta, Canon, Norfolk Line, Trans Ocean Shipping, Price Waterhouse Coopers, Enskilda, Star Alliance and many, many more. ... and thousands upon thousands of wonderful and quite ordinary people. or write us directly and we will get right back to you!